Today is Giving Tuesday, a day amidst all of the holiday bustle when people worldwide find ways to give of themselves. So today, we would like to share with you a way that we have been honoring Caemon, a way we can all give in Caemon’s memory. Just a few months after Caemon died in 2013, I got in touch with a representative from St. Baldrick’s, an organization whose sole purpose is to fund pediatric cancer research, and I spoke with them about ways in which we could honor our son, one of which was a Hero Fund that would be directed to JMML research. In June of that year, Jodi shaved her head at our first St. Baldrick’s fundraiser, organized by Caemon’s uncle. A year later, we did it again, and this time one of Caemon’s oncologists joined us. With that fundraiser, we finally had enough to start our fund. Today, we would like to unveil to you the Caemon Marston-Simmons Hero Fund. Caemon’s fund will provide grants specifically for JMML researchers as they continue to try to understand this disease. It is yet another way for Caemon to continue to make a difference, another way for him to live on. But why should you give to St. Baldrick’s on Giving Tuesday? For us, this is personal in so many ways. You see, that same oncologist who shaved his head at our event last summer is also making some truly groundbreaking discoveries using Caemon’s own cells. You can read an article about the important work he is doing here: Rare Childhood Leukemia Reveals Surprising Genetic Secrets (note that the boy mentioned in the end of the article is, in fact, Caemon). 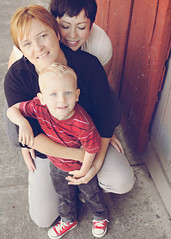 His research is funded in large part by St. Baldrick’s grants, and his research is inspired in so many ways by our son. St. Baldrick’s continues to seek out the best researchers in pediatric oncology to ensure they have at least some of the funding they need to understand pediatric cancers. We want to see an end to JMML–to all childhood cancers. We want these kids to have a greater chance at survival, and we know that supporting St. Baldrick’s is one way we can help ensure that happens. Please join us today in giving to St. Baldricks. Help us grow Caemon’s Hero Fund, and help us support these researchers who want to put an end to this disease. This entry was posted in Uncategorized and tagged Caemon, Caemon's Legacy, childhood cancer, Giving Tuesday, St. Baldrick's on December 1, 2015 by T.
No matter what space I occupy, there’s an elephant, with all its cliché trappings, and I have to work pretty hard to balance acknowledging it and working around it. The elephant, of course, is that I had a child who died of cancer, and I fiercely grieve him, even two and a half years later, and yes, even in the wake of a beautiful new baby daughter. Shouldn’t her arrival make that pesky elephant disappear? Or shouldn’t it at least make fewer appearances? Once might think; then again, one would be wrong. A week after we brought the baby home, Timaree’s whole clan came to welcome the baby to the family. There was a seven-year-old, a five-year-old, and a two-year-old all crowded around Little Sister, completely enraptured by her. Grown-ups busied themselves preparing food and waiting (not so patiently) for their turn to hold the baby, meanwhile catching up on months of backlogged news. So and so is moving! Grandpa got a new job! Another pregnancy! It was familial chaos, beautiful, brilliant, and achingly incomplete. There should have been four children clamoring around the new baby. Timaree and I looked at each other, and we both saw it on the other’s face. Now, how can that big elephant fit in a space so occupied with family and love? Just before our daughter was born, we ran into an old friend from our moms group whom we haven’t seen since Caemon’s memorial service, and she was telling us all about her daughter and how she’s starting first grade, and there that elephant was, reminding me that my son would have been in first grade had he lived. Sometimes others see the elephant, and sometimes not. I believe it is the burden of the bereaved parent to feel the child’s absence at the molecular level in a way others cannot. I do not resent anyone for not seeing how loaded holidays and celebrations and milestones are for me. When a few special people acknowledged Timaree and I on Mother’s Day, even though Caemon was gone and Little Sis wasn’t here yet, they were acknowledging that elephant so beautifully, and for that, I love them more fiercely than they may know. Today is August 21st, and the elephant is rampaging. Three years ago, Caemon was diagnosed with leukemia. D Day (or, diagnosis day) is a rough day for cancer parents. We hate it, dread its arrival, and it clouds everything, even dampening the bliss of new baby. Of course I am over the moon at her arrival. She’s absolutely amazing, but Timaree and I don’t get a day off from the elephant because when this anniversary passes, we will anticipate our son’s birthday in September. Now I know there are some judgmental folks out there that think Timaree and I should be done with all this grieving business; some who have suggested we no longer write about our grief, that we should instead focus on “joyful things.” Now that there are actually joyful things to think about, I imagine we will, but to deny the elephant that walks alongside us on this journey is to ignore our son, our loss, and allow him to vanish into the fog. No way. That’s not happening. As long as I live, Caemon’s legacy and memory will remain. Like so many things in life, if you fear the elephant, its presence is dark, scary, and unwelcome. But if you turn around and look at it, stroke its ears, tell it “I see you,” life becomes a lot more authentic and manageable. Today is Caemon’s D day. How will I face it? Today I write. On his birthday, we will launch the C is for Crocodile Little Free Children’s Library. This is how not to get trampled by the elephant in the room. This entry was posted in Uncategorized on August 21, 2015 by T.